We have always been passionate about feeding people and giving them the nutrition their body needs. That’s why it’s heartbreaking to learn that within our community, 1 in 4 children live in a food-insecure household. This means 25% of North Texas children are not guaranteed 3 meals a day, much less the nutrition their growing bodies need to stay healthy. Additionally, hunger greatly impacts children’s ability to succeed academically. For these reasons and countless more, hunger is a serious problem in DFW. Since 2008, September has been recognized as Hunger Action Month – a time for us all to gather together in the fight against hunger. Throughout Hunger Action Month, people strive to end hunger in their neighborhoods, towns and cities and work to provide relief for the 48 million people who live with daily food insecurity. Because the problem of hunger is so vast, it can be difficult to know where to start. Thankfully there are many simple ways you can participate in Hunger Action Month. Don’t miss this chance to love your neighbor! Raise awareness by posting on social media, texting friends or involving your coworkers and family. Educate your kids on food insecurity. Host a canned food drive for your local food bank. Volunteer at a local food bank, such as North Texas Food Bank’s Community Pantry, School Pantry or Distribution Center. (For a full list of volunteer opportunities with the North Texas Food Bank, visit https://www.ntfb.org/volunteer). Participate in events that benefit local food banks, like Harvest or the food drive at the State Fair. Increase opportunities for urban food production and brush up on your gardening skills with groups like the Dallas Coalition for Hunger Solutions or Bonton Farms. Start training for Gear Up To End Hunger, a bike race for the cause. Tarrant Area Food Bank has also made a really great list of ways you can help with this cause all month long. Some of the activities include eating at certain restaurants that donate the proceeds of a meal. Get their full list of events and ways to participate here. One of the ways that we’ll be helping fight hunger, is by participating in the Empty Bowls event like we did last year. It’s on October 18 and we’ll be serving Thai Vegan Green Vegetable Curry over Sesame Basmati Rice. Together, we can end hunger. Every donated meal or hour of your time has the potential to make a huge difference in our community. 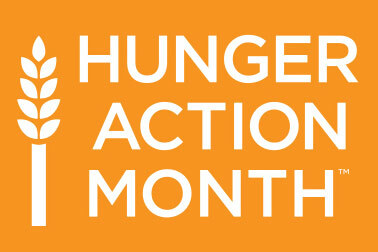 Thank you for participating in Hunger Action Month!